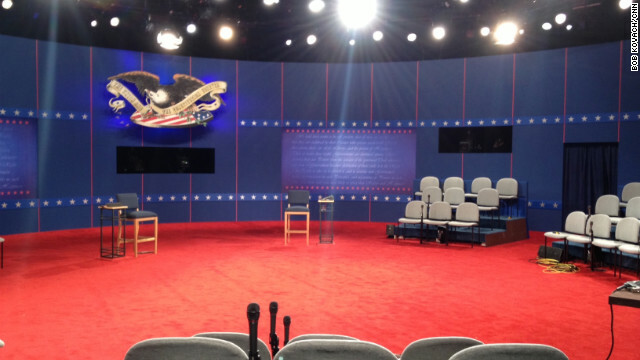 Hempstead, New York (CNN) - On the eve of the second presidential debate here at Hofstra University on Long Island, a new survey suggests that the race for the White House is a dead heat. A CNN Poll of Polls that averages seven non-partisan, live operator, national surveys conducted entirely after the first presidential debate on October 3rd indicates President Barack Obama at 47% and Republican nominee Mitt Romney at 48% among likely voters. The seven surveys averaged in the CNN Poll of Polls are: American Research Group (Oct. 11-14); Gallup Daily Tracking Poll (Oct. 7-13); ABC News/Washington Post (Oct.10-13); Politico/George Washington University (Oct. 7-10); Monmouth University (Oct. 8-10); Fox News (Oct.7-9); and Pew Research Center (Oct. 4-7). Since it's an average of multiple surveys, the Poll of Polls does not have a sampling error. The closeness of the numbers accentuates just how much is on the line when Obama and Romney faceoff Tuesday night at a town hall style debate. "The new polls show the race has snapped back to the fundamentals. The margin of comfort Obama enjoyed in September is gone; it was based on voters who were dissatisfied with his performance but didn't see Romney as a viable alternative," says CNN Senior Political Analyst and National Journal Editorial Director Ron Brownstein. "Clearly at the first debate, Romney crossed that threshold for many of those voters. Which means we are back in a race that is structurally close, and linked tightly toward Obama's performance." But the presidential election is not a national popular vote contest. Instead it's a race for the states and their electoral votes. And a new CNN Poll of Polls in the crucial swing state of Virginia, where 13 electoral votes are up for grabs, indicates it's all knotted up, with Obama at 48% and Romney at 47% among likely voters. The three surveys used to make the average are NBC/WSJ/Marist (Oct. 7-9); Quinnipiac University/CBS News/New York Times (Oct. 4-9); and American Research Group (Oct. 12-14). And CNN Poll of Polls compiled and released over the weekend in two of the biggest battlegrounds, Ohio (where 18 electoral votes are up for grabs) and Florida (where 29 are at stake) also indicate close contests. Going beyond the top-line numbers, the new ABC News/Washington Post and Politico/George Washington University national surveys indicate a rise in the former Massachusetts governor's favorable ratings, most likely as a result of perceptions of what was generally regarded as Romney's strong performance in the debate in Denver on October 3. The Politico/George Washington poll indicates the president's once large advantage on favorability has disappeared. The numbers suggest the president has a large to-do list Tuesday night when he shares the stage again with Romney. "As you see in these polls, the president's job approval rating remains right around 50 percent-which means we are likely heading for a very close finish. It also means that among the many challenges facing Obama in the next debate, the first among equals is convincing wavering voters that he has a plan to make the next four years better than the last four –something he almost utterly failed to convey at the first debate, and which has allowed Romney to be heard "as the voice of change," as Stan Greenberg and James Carville put it in a Democracy Corps memo released this morning," adds Brownstein. At any given time an article declares a tie with an incumbent it literally means the incumbent is losing badly and the numbers can't be manipulated further without setting off the alarm. There were no WMD's in Iraq's arsenal. Bush found none after the invasion. All these years of ad nauseum and you still do not understand. Can it be that people are starting to understand it is about jobs? Not government jobs which require more taxes to fund but private sector jobs that create tax revenue. The math is simple, less government spending, less government jobs, and more private sector jobs with a larger tax base (not higher taxes) equals a balanced budget. Too bad we have to take into account all the interest payments on the debt to balance the budget, but that's what spending more than you take in will get. Amazing how anyone could seriously vote Romney/ Ryan. This guy despises the middle class, has most of his money in off shore accounts and doesn't have a clue how the average American is living. I've never heard a candidate blatantly lie the way Romney lies. Wish someone would mention these little lapses in truth that Mr. Romney and Mr. Ryan have made. Mr. Romney "borrowed" music and used dialogue from a tv show for his campaign. He did so without asking and that is bothersome not because he used them but because if any other politician had done so it would have been front page news. It was wrong. Mr. Ryan made his race time look better. Of course we must just giggle and let him go on his way. He has pictures taken to be used in time Magazine and then complains when they use them. How many other facts and figures were tweaked to make them look better. His budget plan is suspect. It will not help the common man but boy do those in the 1% do well. That same 1% who cannot afford to either pay more or do more to help this nation. Instead their money, as does some of Mr. Romney's money is invested in off-shore accounts and Swiss bank accounts. How do Patriotic Republicans explain this? Do they believe that we all should be putting our money into banks in other countries? Of course we could avoid paying taxes. Why are we avoiding this issue? It should be front page news. Do you have these accounts? Do you think that someone running for President should have these accounts? Mitt Romney, the former Massachusetts governor, is a lying, bad-mouthing, worse than the worse "Used Car Salesman", and is one whom will do or say anything to close his deal! Romney was even nicknamed "Etch-A-Sketch Romney" by his own republican party during the republican presidential primaries! Mr. Romney uses people, organizations, family, and even his church to make his sales pitch to further his own personal gain. After he was elected as governor to Massachusetts, he abandoned the people and even stooped low and bad-mouthed the State of Massachusetts! Mr. Romney even bad-mouthed England when he made a trip overseas while he was trying to build-up his presidential running papers! Don't elect Mr. Mitt Romney for the presidency of the United States or he will do the same to his country and to the American people as he did to the people of the State of Massachusetts! Please wake up and recognized who Mitt Romney really is and that he is only interested in fulfilling his goals for his own personal financial bottom line! I don't know anyone who is happy with Obama's first term. Some people tolerate it but no one is happy. Obviously, you sleep all day and complain you are still unemployed. I am one of the MANY people who would NEVER vote for WillardM. Romney and who looks foward to voting again for the president on November 6, 2012. Have you seen the WMDs? I'm not stupid. I remember what a catastrophe "Conservative" 2000-2008 turned out to be, even though that's the time the self-styled "job creators" and the 1% got all those incredible huge tax cuts. 0% on dividends, 15% on gains, and of course Romneys's specialty, "carried Interest". And then we LOST more jobs than almost anytime in history! ANYONE BUT A REPUBLICAN for 2012! ok Paul... Do you even know what the 'Middle Class' is??? With Romney the economy will actually GROW... meaning more money and jobs (not just part-time Obama jobs) for everyone. What will stop is that those 15-20% of capable Americans who do nothing and abuse the system will be forced to work or starve to death..